Grilled peaches with mascarpone cream is a delightful summer treat. Sweet juicy fresh peaches, refreshing whipped mascarpone cream, boozy salted caramel sauce and crunchy almonds. Summer snacking doesn’t get any better than this! to good use, lemme tell you. We’ve been grilling everything from corn on the cob to burgers and now we’re grilling fruit too. Grilled peaches taste wonderful – sweeter, juicier, with a hint of smokiness from the grill. Then top it with mascarpone cream and bourbon salted caramel sauce and crunchy almonds. Get ready for something wonderful! I’m in a bit of a mascarpone cream phase, aren’t I? I mentioned when I shared my recipe for Strawberry Lemon Parfait that I was recipe testing tiramisu and that started it all. I now want mascarpone on everything. It makes everything so creamy and delicious! Anyway, I initially wanted just the usual peaches and cream but decided to put mascarpone because mascarpone. It makes the topping richer and so luxurious. Did I already mention I love mascarpone? I knew I wanted to drizzle sauce on it too so I made a batch of my Salted Caramel Sauce and added bourbon because…honestly, do we really need a reason lol!? For texture I chopped some almonds and I was set. Put them all together and what you have is a dessert that screams summer. Peaches are gorgeous this time of year and if you’re looking for different ways to eat/devour them, grilling is a great way to go. And grilled peaches with mascarpone cream drizzled with bourbon salted caramel sauce and sprinkled with crunchy almonds is just terrific. All the components go so well together and the peach flavour shines through all that delicious topping. It’s bright, scrumptious and so easy to whip up too. So the next time you’re grilling (which I assume is all the time like us!) put some peaches on there. Enjoy! Grilled peaches with mascarpone cream is a delightful summer treat! Fresh peaches, refreshing mascarpone cream, boozy salted caramel sauce, crunchy almonds. Brush the cut side of the peaches with olive oil and grill cut side down on medium high heat for about 5 minutes or until tender (see notes). Carefully remove and set aside. Whip 1/2 cup heavy cream, 1/2 cup mascarpone cheese and 1/2 teaspoon vanilla extract until you reach medium stiff peaks. Chill until you're ready to use (see notes). Follow this recipe for salted caramel sauce. Add the bourbon together with the vanilla and remove from heat. Allow to cool before using (see notes). Dollop a generous amount of mascarpone cream on top of each grilled peach. Drizzle with bourbon salted caramel sauce and sprinkle with chopped almonds. Serve immediately. We like our grilled peaches tender but still firm. You can grill them for longer if you want them softer. It's best to prepare your mascarpone cream just before you serve your peaches so it's freshly whipped and cool. On the other hand, bourbon salted caramel sauce can be prepared up to two days ahead of time. Just store in an air-tight container. Do not refrigerate. If it hardens, microwave for 10 seconds and give it a quick stir. Did you make grilled peaches with mascarpone cream? And how are you liking our No-Bake Summer so far? I’d love to hear from you in the comments section below. Click here for the rest of our No-Bake Summer Series recipes. Love peaches and other summer fruit? Here are more recipes you can try. I love peaches, but have never prepared them this way. Combining the peaches with all that you mentioned – sounds delicious!! This looks so delicious! 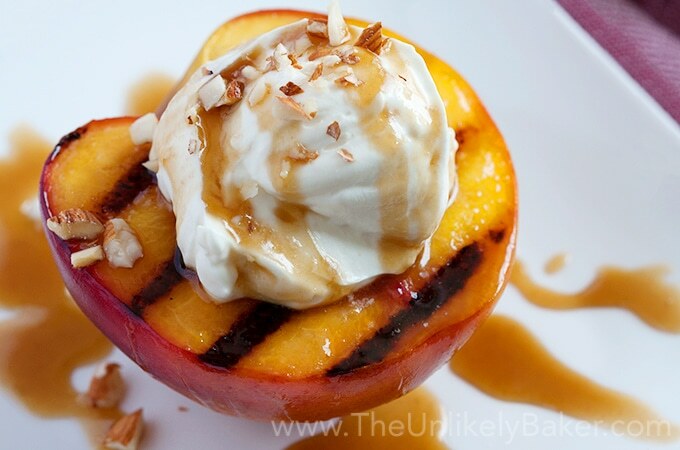 Grilled peaches are one of my favorite summer desserts! Grilled peaches sound really tempting, need to try them out. Recently had the pleasure of eating peaches straight off the tree, absolutely loved it. Thanks! It’s fast becoming one of our favourite snacks/desserts 🙂 So good, hope you get to try it! Right?? It’s 2 delicious things in 1 go 🙂 Enjoy! I would have never thought to top them with caramel. Sounds so good! That bourbon salted caramel sauce is everything! When we ran out of peaches we drizzled the extra sauce on basically everything lol. These sound amazing! Grilled peaches are the best, and I love all the things you have put with it! I am drooling! I need this in my life right nowwww!!! I am obsessed with peaches. I live in Georgia so we have them out our ears. I’m ok with that because you can make stuff like THIS with them! Ok I’m moving there! Lol! I love peaches, there’s so many things you can do with them. I love mascarpone cheese, I could eat it right out of the tub. I have never mixed it with peaches, that is perfect. You and me both 🙂 So good! And it works really well with these grilled peaches. Enjoy! Oh wow that looks amazing. My mom would love this, I just might have to try and make it. Thanks! Hope you both like it! These look absolutely amazing. I love grilled peaches but I have never put mascarpone cheese or cream on them! I wish I could fine mascarpone here I would definitely be giving these a try. What a mouth watering dessert that is! 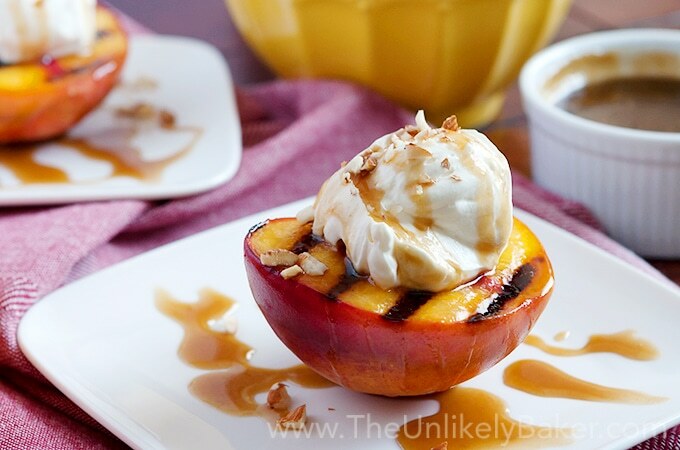 I love grilled peaches and the Bourbon salted caramel sauce and mascarpone cream made this treat even more delicious. I am making this on the last weekend before the kids go back to school. Thank you for sharing this fantastic recipe. The salted caramel sauce is a lovely addition to the recipe! I love grilled peaches or any other grilled fruit for some reason. This is definitely a must try for me! this looks like the perfect dessert for a hot summer night. I love peaches! These Grilled peaches with mascarpone cream are sure to be a hit for my next dinner party. I am excited to make some for a test run this weekend. Awesome! Hope you and your guests like ’em! I’ve made grilled peaches several times, and I actually have a recipe for them on my blog, but I love the way you elevated this! I keep hearing about grilled peaches but I haven’t tried making them yet. They sound amazing with marscapone on them. There isn’t a thing I don’t like about this peach recipe. Fresh grilled peach, cream and the sauce sound amazing. OMG these look amazing! I love the grill lines! Great photos too! I love this recipe! It would be something I’d have as a cheat day desert! That looks terrific and sounds like it’s tasty! I’d like to try that, and think it would go well with cold milk. I love grilled fruit. Then adding mascarpone and caramel to boot is just making it all that much better. This is literally heaven on a plate for me. One of my favorite fruit is peaches and I would love to try them on the grill. I have never tried really know but I’m defiantly going to. My entire family loves peaches, especially fresh ones. However, I’ll be enjoying this treat hiding in my closet. Sorry, no room for sharing! Yum! This looks heavenly. I am going to put marscapone on my shopping from home list – I hope my store has it! I’m not a fan of peaches but boy did you make them look so appetizing! I’m sure I’d give this recipe a try. The caramel sauce on top sounds wonderful. The Strawberry Lemon Parfait also sounds great! I hope this helps change your mind about peaches 🙂 If not, that bourbon salted caramel sauce is ahhh-mazing! We put it on ice cream, chocolate treats and other fruits. The combination of fresh peaches, whipped mascarpone cream, boozy salted caramel sauce, and crunchy almonds sounds ridiculous delicious! What a yummy treat for hot summer weather! I have been seeing peach recipes all over the place lately, but I think this one is my fav. There’s nothing like a fresh peach. I’ve never tried grilling them before, so this would be a real treat. Me too, it’s peach season and I guess people want to enjoy them before they disappear 🙂 Grilling them is such a treat, hope you like it! These look amazing! I have been on a mascarpone kick lately so this would definitely fill that! This literally looks like the perfect dessert! 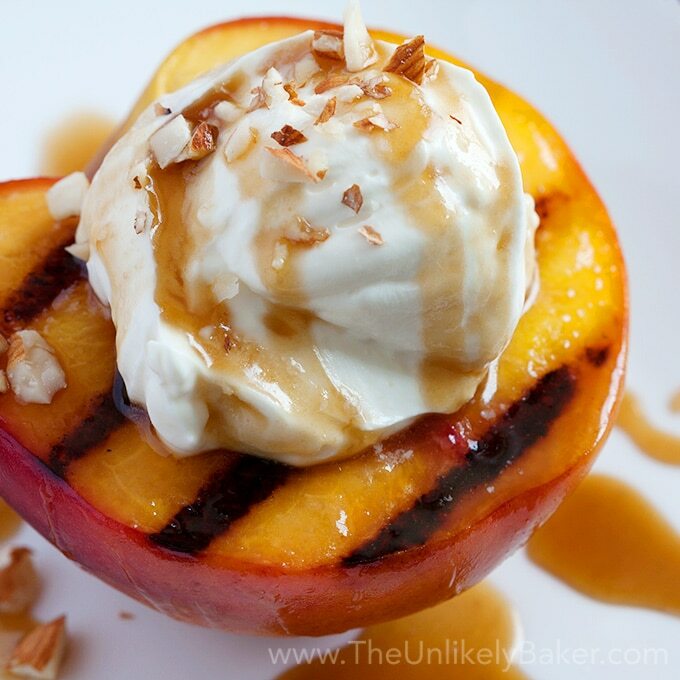 Love marscapone cream and the grilled peach sounds sweet ~ not to mention that sauce! Wow! Great recipe! 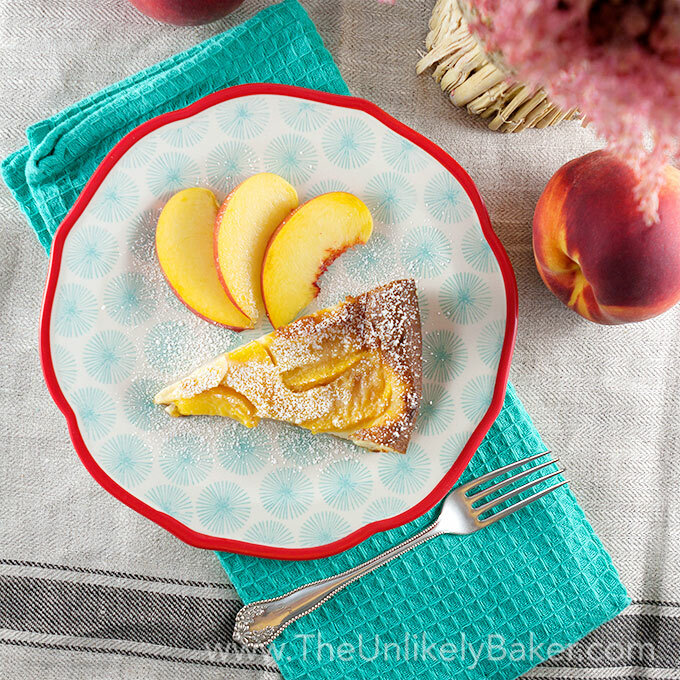 Now this is the perfect way to use peaches for a dessert! It sounds so good and it definitely looks impressive! Ok, this looks absolutely AMAZING. 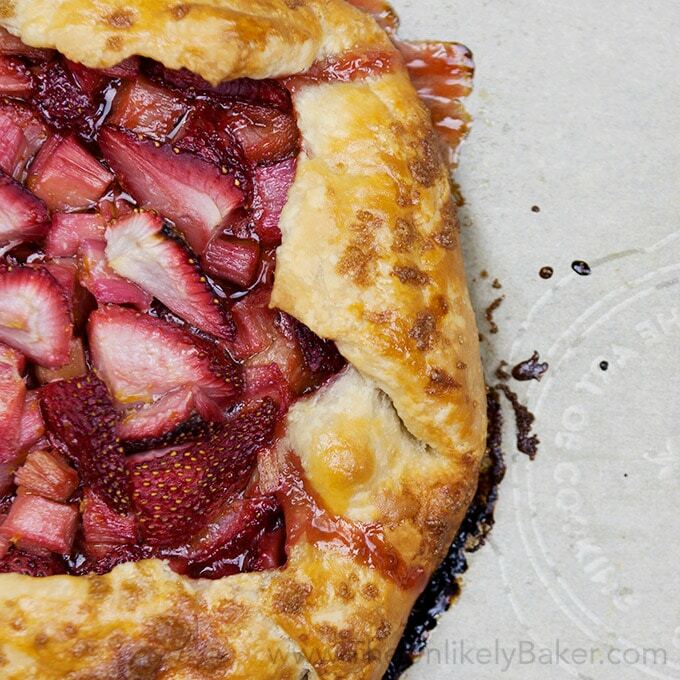 This would be a perfect dessert for a summer dinner party, and a great reason to take the party outside as well. Thanks for sharing! I’ve never thought of grilling fruit. I am going to have to try this out! What a perfect dish! I love the creativity. This is such a “healthy” dessert! Right? Mascarpone cream is so delicious! I could eat spoonfuls of it on its own, but putting it on peaches, yes please! 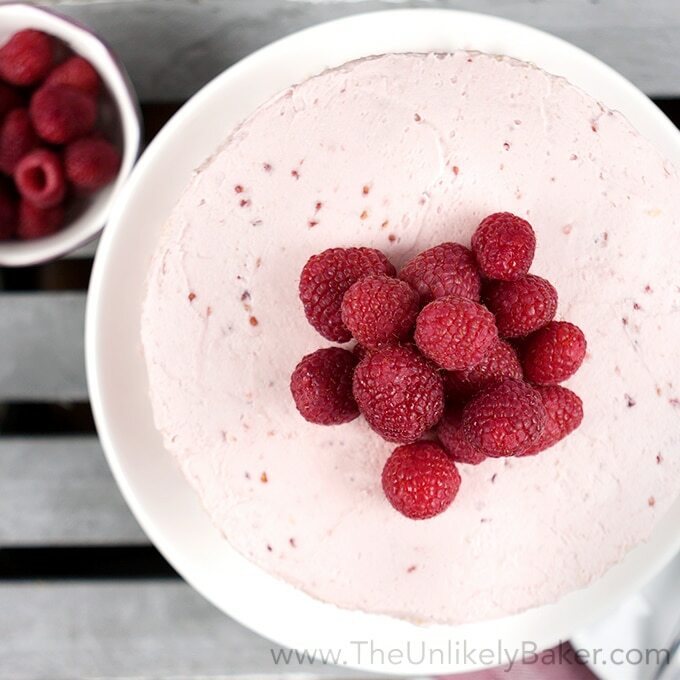 Oh my goodness, this sounds like the perfect summer dessert! 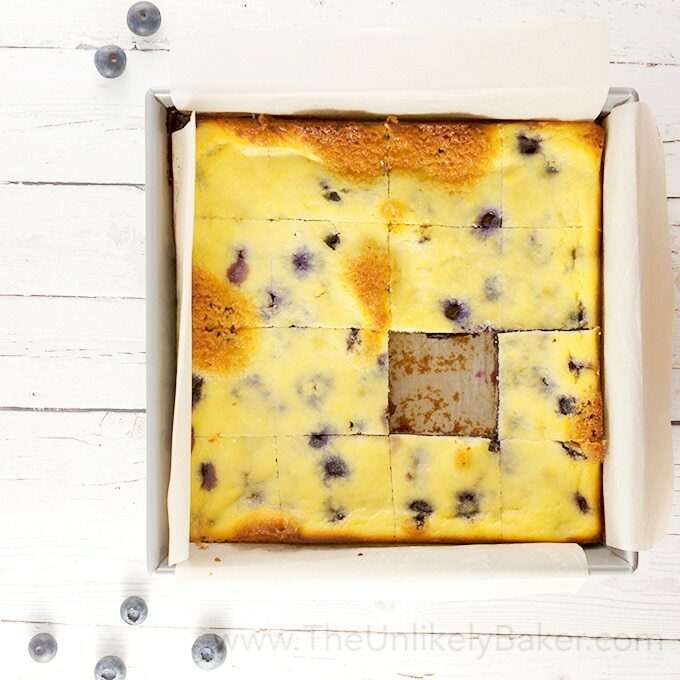 I’m going to have to find an excuse to make these asap! This looks so tasty and fresh! I just love grilled peaches, and the bourbon tie-in sounds delicious! Yum yum yum! 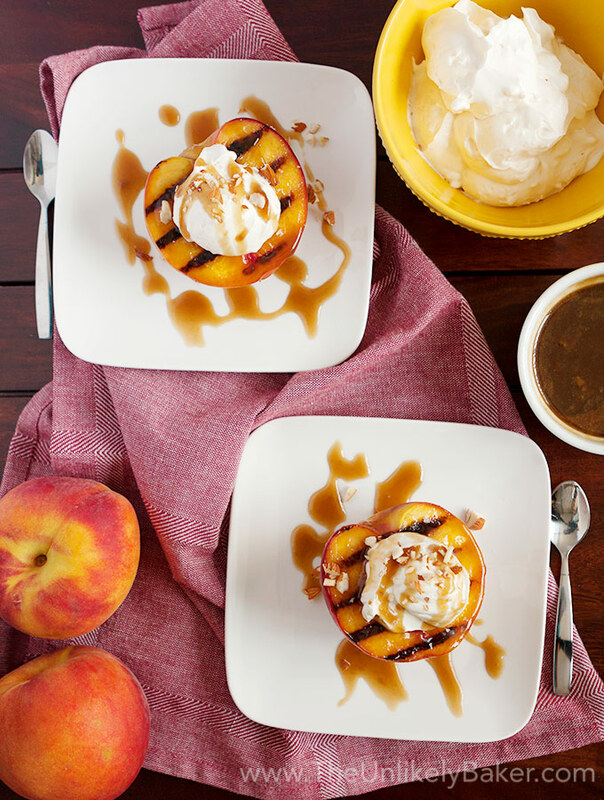 Grilled peaches + mascarpone + salted caramel sauce… what’s not to love??!!! WE went peach picking a few weeks ago and wish I had some to make this. GUess it is the perfect excuse to go again. Love summer for things like this. I’ve never made grilled peaches before; I’ve done pineapple though, and it is so delicious. This looks so good, especially with the Mascarpone cream. Wow this looks yummy beyond words!!! Would love to try it sometime but I know it won’t come out as great as yours looks! OMG that sounds AMAZING! I love peaches with mascarpone so this is just a perfect dessert for me! I cant wait to try it now! Thank you so much for sharing this fabulous recipe! Wow, it looks delicious. I basically love anything with caramel. Although I try not prep my own dessert, i might try this one. Now this is a summer dessert! YUMMM I’ve never grilled peaches before but these photos make me want to ASAP. These grilled peaches look absolutely divine! I love the idea of a caramel sauce and mascarpone. Peaches dessert elevated to the next level. I love all the components.